Have an exciting day at Heartlake High with Stephanie and Matthew. Ride Stephanie's pretty blue bike to school. First, store her bag and her laptop in the locker, then head to science class and study plant cells under the microscope, experiment with chemical reactions using the beakers or look through the astronomy telescope. Be the star of biology class when Ms. Stevens calls you to the chalkboard to identify the different parts of the owl's body. Help Matthew to point out the capital cities on the world map in geography class. Then Stephanie and Matthew wash their hands before lunch. 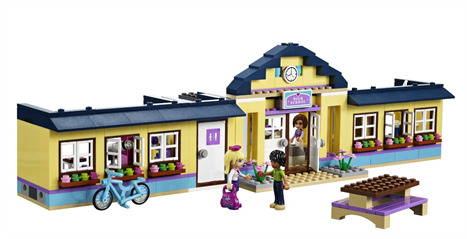 Take some sandwiches and juice from the cafeteria and eat in the sun on the picnic table. Bring on the creative fun after lunch with art class and an easel and then have music class with the guitar. After school, play basketball with Matthew or go for a bike ride. 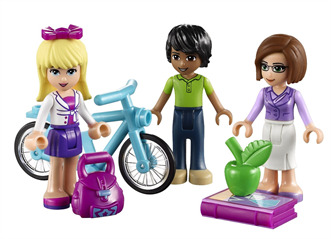 Includes Stephanie, Matthew and Ms. Stevens mini-doll figures. 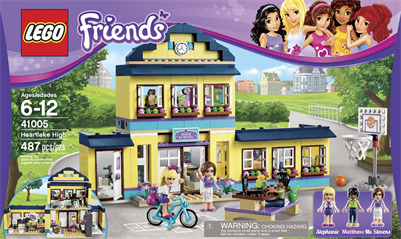 487 pieces. 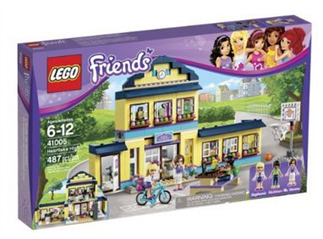 Once again, LEGO Friends is on many young girls' wish lists. 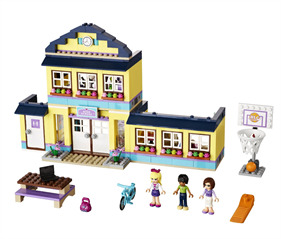 LEGO designed the Friends systems for girls who love to build and play. 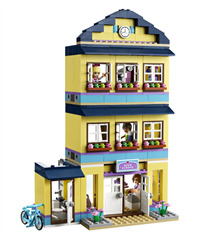 Heartlake High is one of the bestselling LEGO Friends systems for the 2013 holiday season.